It’s the prototype of all electronically-induced audio fear, a serialist symphony of digital terror. It begins life as an occasional squared-off blip of sub-bass as the alien forms jerk lazily across the empty black sky. Ripples pass across the phalanx as the 8080 processor struggles to render them in their new positions (suggesting that the fearful acceleration as they are dispatched owes as much to technical artefact as to design). The ominous slow-motion percussion is totally consistent with the putative scenario; the aliens hang in the air, malevolent, their slow progression across and down the screen as yet a distant threat. Midway through the proceedings, your shields eroded by an increasingly relentless battery of missiles, the descending four-note phrase becomes a sort of ironic oom-pah, a muffled intimation of an advancing army’s marching song. Then suddenly you’re alone, with one surviving invader. The struggle takes on a personal aspect, the little white shape pursuing a fevered kamikaze vendetta against your beleaguered turret. And the sonic accompaniment drops all pretence of being anything but a terror tactic militating against your survival. The blocks of sound merge into each other, the manic buzz of the oversized insect descending too fast. Their vibration bristles in the fingertips of your cramp-plagued hands. A saucer glides overhead, a remote presence monitoring the status of the endgame below, an ullulating waveform accompanying its reconaissance flight. But there’s no time to target it. The boustrophedon movement that in full phalanx seemed so stately is now an insane zigzag that doesn’t leave you a second to think. Need to calculate relative trajectories with pinpoint precision. Every pass it makes, writhing tentacles blur, closer…closer…even if you win the battle, they’ve won the war, they’ve taken over your brain. The xenovirus spreads transversally: first the twitchy feedback loop extends outside the game itself, reconstituted as a parasitical feeding mechanism with a healthy disregard for the comfort of its host (‘Many incidents of juvenile crime surrounded the release of this game. 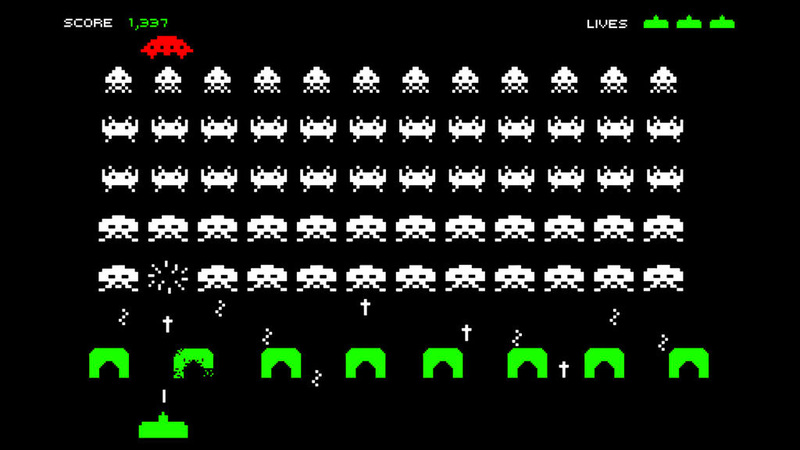 A girl was caught stealing $5000 from her parents and gangs of youths were reported to have robbed grocery stores just so they would have money to play the game.’) And then into social and economic planes (‘The Space Invaders phenomenon stunned conservative adults who were certain the games soured the minds of their youngsters. Residents of Mesquite, Texas pushed the issue all the way to the Supreme Court in their efforts to ban the illicit machines from their Bible-belt community…The game was so amazingly popular in Japan that it caused a coin shortage until the country’s Yen supply was quadrupled.’). It’s the catalyst for a new industry which within 30 years will be one of the most financially significant forces on the planet, a global stealth invasion of youth by alien xenotonic compulsions. One last explosion of random pixels and it’s over.